My grandfather, Joe Migliore, passed away on Wednesday while I was in Israel. He died in his sleep at 95 years of age. The Israeli family we were staying with told us there is a word in Hebrew that means “the kiss” for this type of peaceful death, which I thought was a really beautiful thought. Although he went in the best possible way, it was still really hard news to hear as I thought about him not being around to joke with, and how our family get-togethers would change without him going forward. He was an elementary school principal for over 20 years, which I always thought was a perfect profession for a man with both a stern, serious side as well as a joking, playful side of his personality. So in love with his redheaded Scottish wife, he told my mom when she was pregnant with her first child (me) that he’d give her a $1,000 if it was a redheaded girl. [And then, true to his word, he happily paid out]. 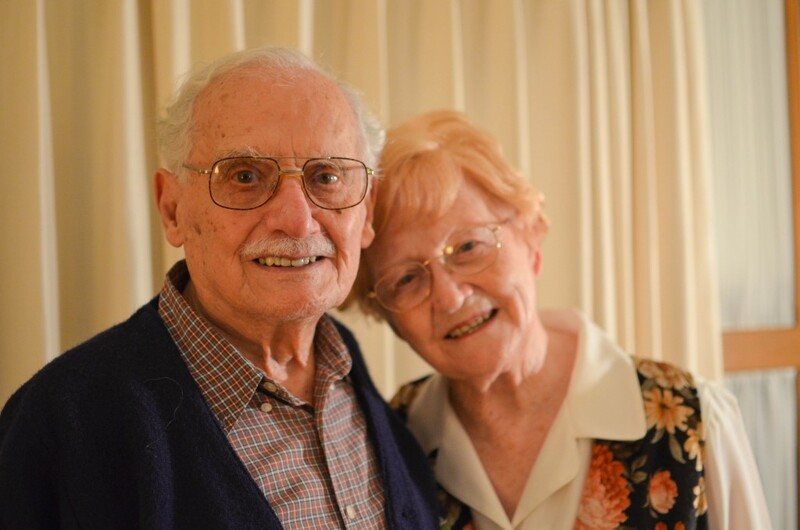 In his later life, he softened even more as he came to appreciate the blessings of grandchildren and was thankful every day for the best decision he ever made… which was to marry my grandmother. He always liked to give me advice whenever I saw him like “Don’t sign a lease” and “Don’t trust men.” After Chris and I got married, he started prodding us about giving him more great-grandchildren (I always liked to remind him that didn’t jive with his “Don’t trust men” bit, which would make him laugh). I’m really thankful I got to see him several times while I was home in Michigan for Thanksgiving; just a week and a half before he died, my sister and I were visiting and joking with him, and we loved every time he cracked up when we gave him sass. Even though he had expressly told me on many occasions while he was alive that I was, under no circumstances, to fly back from anywhere for his funeral (he often—with his former school administrator side coming out—would like to talk about the details of his funeral many years in advance of when it actually happened). Of course, we promptly ignored that one wish, and Chris and I, through a series of miracles, were able to change our itinerary to fly to Africa that night to go to Detroit instead. [We’ll be skipping Zanzibar and Rwanda, which were up next, and heading to South Africa right after Christmas… another blessing as we were both sad about not being able to be with our families for Christmas]. Now I’m home, and we’ve had a lot of fun writing out thoughts for the minister about his life and going through pictures of him through the years (there’s some seriously cool ones of him when he was really young with his family that look straight out of The Godfather). He had a rich, full life and created with my grandma such a legacy of love and family. I can only hope to be so lucky at 95 years. I am so sorry for your loss my thoughts and prayers are with you and the rest of your family. Thanks, Nemma! Love you too. Sorry for your loss, Lauren. He sounds like an amazing man that you were able to call grandfather. Enjoy cherishing the memories of him with your family. Very beautifully written Lauren. Thinking of you all, especially to be safe on your travels. Hugs to you both! I am so sorry, Lauren. What a beautiful note you wrote. He sounds like he was a wonderful man. I’m happy that you will be with your family to remember him and comfort each other. I’m so sorry to hear this, Lauren, and I know you will be glad to be home with your family. Safe travels. Thoughts and prayers for you and your family, Lauren! I was confused to see the picture of you and Chris at the Wings game, so I came to your blog, thinking the answer would be here, and it certainly was. What a beautiful tribute to your grandpa! So glad you and Chris are able to spend time with family at Christmas! So sorry to hear Lauren! Happy you got to have Christmas with the family though!